Sri.N.P.Ramaswamy, the veteran carnatic musician, a post graduate in Applied Chemistry is the great grand son of Sri.Palakkad Parameswara Bhagavathar who was the Asthana Vidwan of during the time of four successive Travancore Rulers such as Swati Tirunal,Uttram Tirunal, Ayiliam Tirunal and Visakham Tirunal. 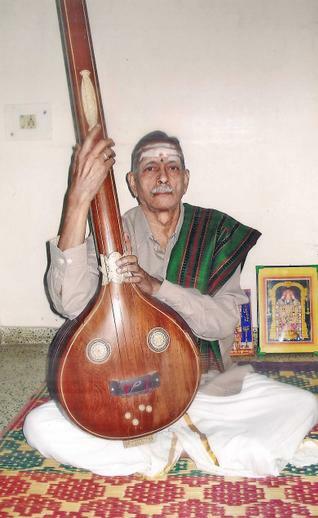 Sri.N.P.Ramaswamy who has performed across the country, started giving concerts from the age of 16 and his career in music has spanned more than 65 years now. His repertoire includes over 1,500 compositions ! A top ranking artiste of All India Radio (AIR), Sri.N.P.Ramaswamy has written many books on Carnatic Music and is a vaggeyakara having composed 20 varnams and 35 krithis and 2 Tillanas. Most of his krithis are in Sanskrit. He is a dedicated Guru and now at 82 he is still going strong with his performance, classes and composing. Sri.N.P.Ramaswamy, is the recipient of the gold medal for Carnatic music from Maharaja’s College, Ernakulam. Other awards that were bestowed upon him were the Sangeetha Ratna, Sangeetha Poornasree awards, the Kerala state award and Sangeetha Thilakam award. Here are a few soulful krithis sung by the great master.. This is his facebook id..https://www.facebook.com/nprswamy.. You may contact him via facebook. I do not know his address. He is a very popular personality living in Mattacncherry Kochi.